The Rev. John Theophilus Desaguliers LL.D., F.R.S. was born in Rochelle, France. 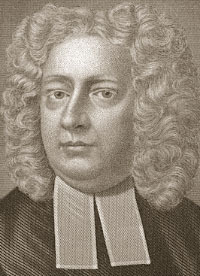 The son of a Huguenot clergyman, Desaguliers was educated at Christ Church, Oxford. His reputation as a lecturer on experimental philosophy obtained for him a Fellowship in the English Royal Society. He was the inventor of the planetarium. Elected the third Grand Master of England in 1719, Desaguliers was a zealous collector of early masonic manuscripts.